Posts. So, those candidates who are willing to work with this organization they May apply for this post. Last Date of Apply 04-May-2017. Total numbers of vacancies are 43 Posts. Only those candidates are eligible who have passed Intermediate and Trade certificate from ITI in woodwork / Tailoring/ Bookbinding/ Embroidery/ Carpenter/ Sewing Technology/ Dress making OR Polytechnic Diploma in Woodwork/ Tailoring/ Bookbinding/Embroidery/ Fashion Technology/ Garment Technology OR A 3-year course in Home Science OR 3-year Diploma in Craft Technology and A Technical Teacher’s Certificate in concerned trade. 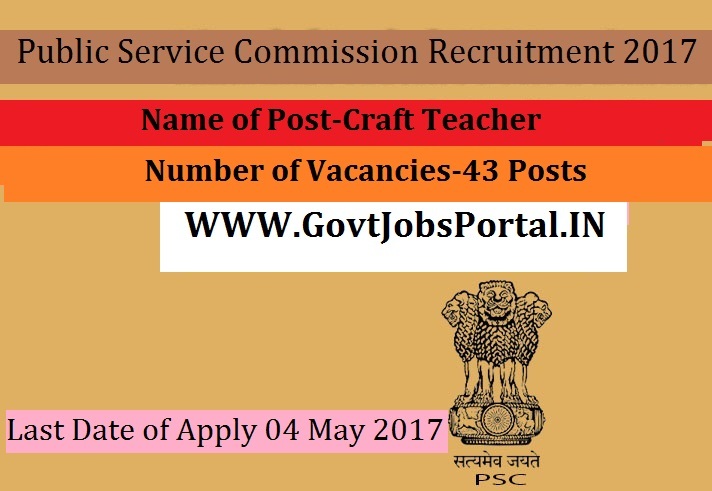 Indian citizen having age in between 18 to 44 years can apply for this Public Service Commission Recruitment 2017. Educational Criteria: Only those candidates are eligible who have passed Intermediate and Trade certificate from ITI in woodwork / Tailoring/ Bookbinding/ Embroidery/ Carpenter/ Sewing Technology/ Dress making OR Polytechnic Diploma in Woodwork/ Tailoring/ Bookbinding/Embroidery/ Fashion Technology/ Garment Technology OR A 3-year course in Home Science OR 3-year Diploma in Craft Technology and A Technical Teacher’s Certificate in concerned trade.